I just want to thank you guys for being so patient while I try and get myself back on track now that I've had the baby. I do want to build a decent buffer again before starting, just because getting myself back into a once a week schedule is tricky. Not impossible, of course, just tricky! As my posts have indicated, I will be doing the Calgary Comic Expo, Otafest and the Panel One Comic Creator Festival again for 2018, and book 5 should be in print in time for this con season! I am also doing more Jojo zines, sorry, I am still Jojo trash, but if that's your thing too, then you have to swing by my table! I will post placements as I get them! My Comic Expo table /should/ be in the same place, but I'm upgrading to a full sized table for Otafest! Our Online Store is OPEN!!! It's all finally up!!! I ended up using Tictail from the recommendations from other comic making friends. At the moment I am not shipping outside of the United States and Canada but you are more than welcome to email me at underdeadskies (at) gmail.com if you would like me to quote you a shipping price. Hey guys, I don’t post a lot of personal stuff on here if I can help it, but this week I have been taking my cat to the vet and there’s a good chance that he might have kidney lymphoma. We don’t know 100% if he does or not yet, he still needs to go in for more testing, but needless to say, my heart just hasn’t been in it this week. 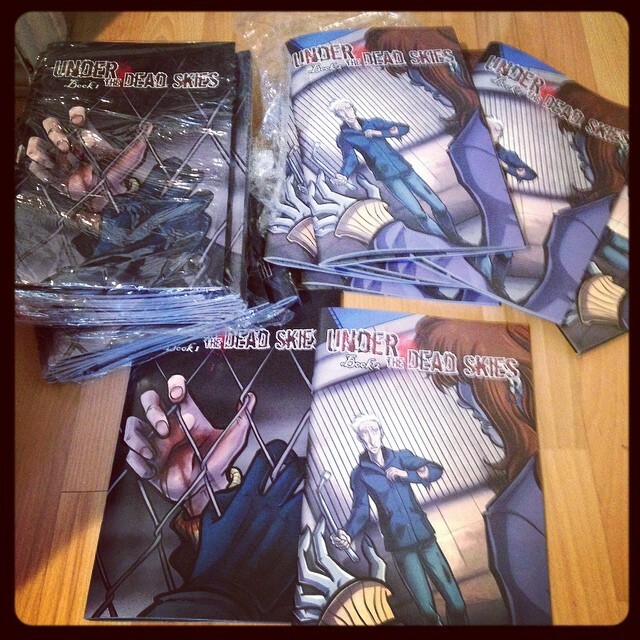 The books are here and ready for the Calgary Comic Expo! If you're going to be in town for the convention, I'll be at table R 06 in the BMO Center under "Moon Jelly Creations" which is my studio name. I'll have a tall banner with our pal wormbie on it, so hopefully I'll be easier to find this year! Due to biting off more than I could chew this week and bad scheduling on my part, I will have the next page by December 5th. I hope my American readers have a good holiday with their families this weekend, and thanks for bearing with me, I know this year has been kind of rough in terms of updates, but thank you for your continued readership! Hey guys, just taking a moment to promo my Patreon page again! I decided to lower the minimum pledge for all the art and sneak peeks from 3$ to 2$ per update, and you get a LOT of art for the 2$ as you can see from the screenshot! It's not required of course, but it helps with the production of the comic and is always appreciated! So up here in the frozen wastes of Canada, we got hit with a freak snow storm. Ordinarily, this isn't a big deal, but because it's so early in the season, we've had some major power outages in the city. My neighbourhood alone has had three since Monday. Unfortunately this means that I won't be doing art streams, if you're a patron on Patreon (and if you aren't yet, and would like to be, here's the link http://www.patreon.com/UndertheDeadSkies ), out of the fear of them being cut short from an outage, but this is also a heads up just in case the page for this week ends up being late. The snow is supposed to clear up starting tomorrow, so I don't think that will be the case, but the power outages are incredibly inconvenient. So sorry for the inconvenience, I'm pretty confident the new shiny page will be done for Friday, we only have TWO MORE pages until the end of this chapter!